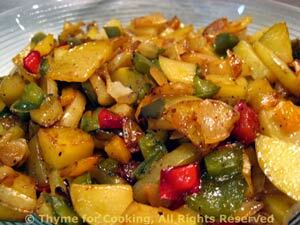 O'Brian Potatoes, with peppers and onions, an easy, flavorful side dish. Fried potatoes take on a new interest with the addition of chopped onion and bell pepper. A simple dish to accompany flavorful meat or fish. Sauté in oil in nonstick skillet over medium heat until just transparent. Chop pepper, add to onion and continue to sauté until just starting to brown. Slice the potatoes into bite-size pieces. Remove onions & peppers from pan and add potatoes - with a drop more oil if needed. Sauté potatoes until light brown and cooked through (taste one). Return onions and peppers to pan and continue to sauté another 5 minutes.